In January, everything from the sky to our complexions looks a little greyer than usual, and we find it pays to counteract all that dullness with some new vibrant colour trends. One of the key themes for S/S 18 is unlikely mixes, whether that's using soft ice cream shades, neutrals, or bold paintbox colours. Designers are daring us to look past navy, black and grey, and experiment with less traditional formulas. And the most controversial colour news is probably the return of lilac: Ultra Violet was named Pantone's colour of 2018. Keep scrolling to see how to wear colour this spring. This spring is set to be brighter than ever, with plenty of designers clashing bold reds, pinks, yellows and blues. Neon brights are even in the mix, too. Get ready to fashion yourself like a Picasso painting because the idea is to wear these paintbox hues all together at once as if styled by a 4-year-old. Lilac might be one of the most feared colours, however thanks to the likes of Tibi and Victoria Beckham, this lavender shade is poised to be the key colour for next season. Pastels might have a bad reputation—they can look a little awkward and wash you out—but these ice cream colours will be unavoidable this spring. Rather than wearing one sugary shade, the trick is to blend baby blue, pink, lemon and pistachio together so you resemble the macaroon counter at Ladurée. 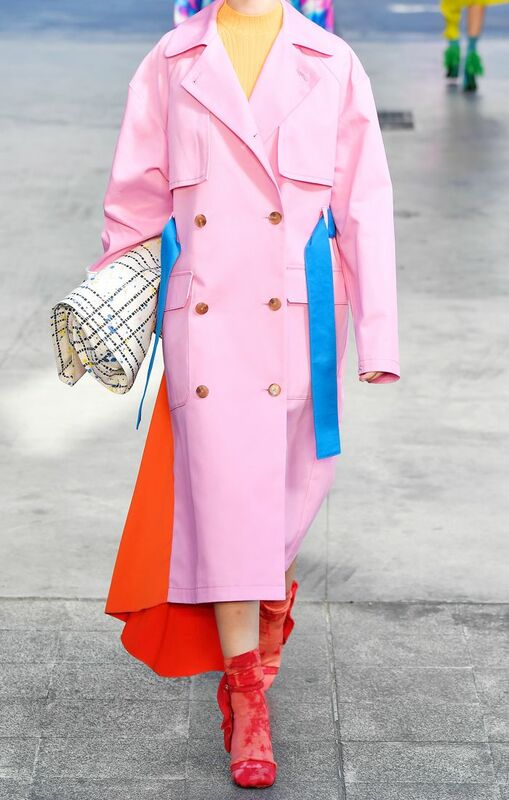 Red and pink was a colour combo that we kept spotting again and again in 2017, and it's continuing for 2018 thanks to designers like Roksanda and Emilia Wickstead. Embrace the clash with this one. Next up, see our guide to the biggest trends for S/S 18.